A Coppell parent makes a case for differentiation and clustering in the classroom. The trigger for this article was something that happened at the CISD Idea Summit I attended earlier this year. One suggestion made during our group discussion was that the ideal teacher would attempt to differentiate and cater to needs of every child. The example given was that of the kid in elementary school, let’s call her Jane, who always completes her work in class and then has to “tutor” or “mentor” the other students. The point being, that if Jane has finished her work, she should not be spending the rest of the class being the teacher’s helper, but be allowed to advance to the next level. So, if she knows how to add, perhaps she could work on multi-stage word problems, or move to multiplication. She should be given the opportunity to work with problems of varied depth and complexity so she does not stagnate, so she can keep moving forward. I was surprised when a number of parents in our discussion group immediately shot down this idea. Of course, we all understand that the number of kids in a class restricts a teacher in how much individual time s/he can give a student. However, that being said, it is not Jane’s job either to be the teacher’s aide. The question asked of us was what we thought a teacher needed to do, and the answer to that was simple- in our current, fast moving, technology driven environment, a teacher needs to look after the needs of every child, whether they are struggling or excelling. At this same summit, a concern was raised that by labeling some students Gifted and Talented, the rest of the students (who were, in effect, labeled “not Gifted and Talented”) would feel slighted. And while I am inclined to agree that the name “Gifted and Talented” itself might be a bit of a stretch (perhaps, in our environment, Honors program or Advanced Academic program might be more suitable), I was left with the feeling that the comments made were more about the fact that we offer differentiated instruction, than about the actual name of the program. To the people with the above concerns, I would like to offer this. The Gifted label is not an indication that a learner is better or superior than the other learners, but an identification of a different need in that learner. It is by no means an elite club that the kids belong to, but a means of serving their individual learning needs appropriately. The concerns raised at the summit were not isolated instances- I often find myself in situations where I feel the need to defend the importance of differentiation and clustering among our learners. And that is why I decided to write this piece. I realize I am probably preaching to the choir here, but I am going to sing my song anyway. To make my point, I would like to step out of the academic realm for a moment. Last year, my middle-school student tried out for basketball. Based on the tryouts, the kids were put into either the A, B, or C team (or did not make the team at all). In cross-country running, the top 7 runners formed the A or Varsity team; the rest of the runners ran on the JV team. In both these cases, the teams were selected based on ability to play the game. In Band, likewise, the kids had to go through an audition process- play a couple of scales and pieces and get slotted into one of three bands, based on their performance at the audition and during the school year. Why is it ok that we routinely group athletes or musicians into ability-based teams, yet it raises eyebrows when they are similarly grouped in academics? Everyone agrees that “it is not good for the team” to put the slowest runner on the A-team. The faster runners will not be able to pull up the slower runners; on the contrary, the slower runners will bring the entire team’s score down. Simple enough. You cannot have mixed ability runners on the A-team, with the hope that it will improve the entire team. You cannot make honor band if you cannot perform the music. Yet, classrooms often contain mixed-ability students, who are all doing the same work, with the hope that the ones that are ahead of the pack, like Jane, will “pull up” the ones that are not at the same level. Everyone understands why you need to differentiate on the athletic field, or in band; yet the same considerations do not come into play in most classrooms. Why is it considered ok to differentiate outside the classroom, and not in the classroom? Why is it ok to cluster students of similar abilities on the football field but not in the academic arena? Yes, this is all very difficult when you have a roomful of 24-25 students, each of whom has their own individual needs. It takes an incredible amount of motivation and dedication on the part of the teacher. Not to mention a lot of time. But all students need to opportunity to learn at their appropriate level; a level that keeps them challenged, a level that will eventually reduce frustration and boredom. And all students, across all abilities, deserve to have the opportunity to learn something new every single day. After all, with new learning also comes the opportunity to learn strategies to help a learner cope with challenges (and perhaps even struggles) that new subject matter may pose. Think of it this way- in the learning environment we have today, the teacher is no longer teaching a subject or a class. S/he is teaching an individual. Think of that individual, Jane, as someone climbing a ladder. Jane does not need to remain stuck on a rung until everyone else catches up; on the contrary, she needs to be able to go to the next rung. She needs to be able to keep climbing up that ladder of learning. With the changes made to the GTi program in Coppell last year, some things have changed for Jane too. She is now in a classroom with 4 other GTi students. Within the GTi program, she is currently at Tier 3, which means she gets the benefit of both a pull-out and push-in service. When Jane is finished with her work in the classroom, she has the opportunity to work on extra challenges from her “extensions box”. She also has the option to visit the GTi specialist’s room and work on her projects there. Yes, more can always be done but this is a start. She is being given an opportunity to grow at her level. She is being allowed to go up that ladder at her own pace. She is less bored or less disruptive in class. Differentiation in this case is beginning to make a difference to Jane. And likewise, it can make a difference to ALL learners. 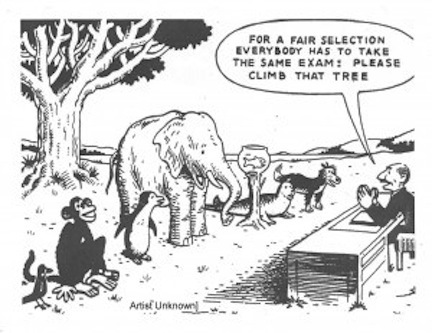 Differentiation benefits all kids because you are meeting each of their individual needs. Clusters help teachers in large classrooms to create a more narrow range of student achievement levels, allowing the teacher to focus instructional activities for students at all levels. As a result, clustering also make a difference because the teachers are able to more effectively and efficiently meet the diverse needs of all the students in the class.